It is one of those beautiful, indian summer, fall days. The farmer and his family have been up since early morning doing their work around the farm. His wife thought it would be a perfect afternoon to have a picnic lunch down by the stream in the grove of trees. 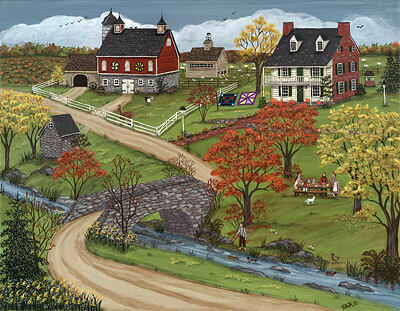 My inspiration for this piece are the many day trips my family has taken through northern Maryland and up into Lancaster, Pennsylvania and the beautiful farm lands and its people. Framed in a dark wood frame and ready to hang.